It appears that this Post Card was not sent to Victor’s “War Parents” but perhaps, instead, one of their sons. Victor’s first language was Belgian so, understandably, some of his writing does not make sense or flow properly. For authenticity, I have left his writings as originally done, almost 100 years ago. 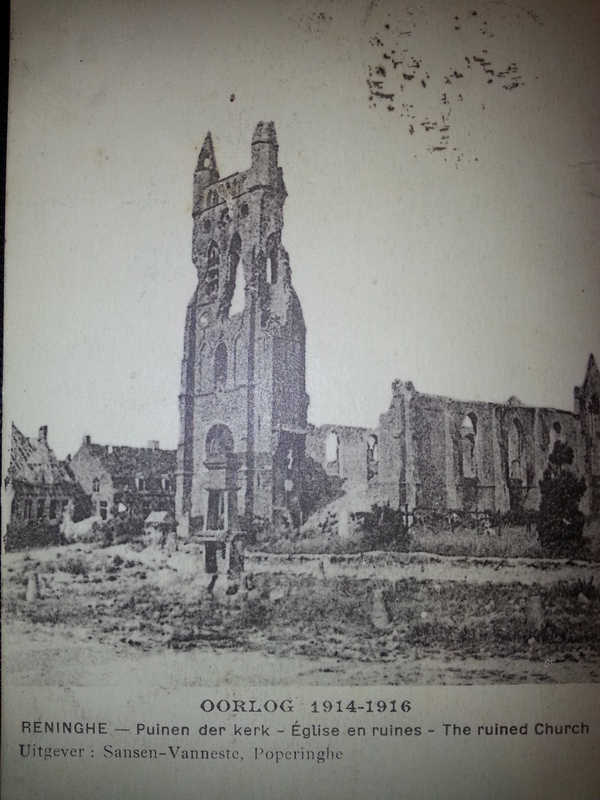 The Post Card sent to the Kenys household by victory on the 18th of April 1916, showing war damaged buildings. Very many thanks for your charming letter. Your remembrance about your short passage in this dear Brussels are excellent. Your generous invitation touches me. The leaves off are suppressed still, it is very significant to get one now. 2 men by company. Beautiful weather in the attacks. I shall wait till after this awful war, and you will come visit our dear country.